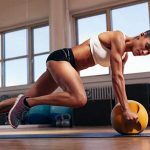 Home » Fitness » Top 5 Weight Training Benefits For Women! Top 5 Weight Training Benefits For Women! Women and weights has been the subject of misconception for way too long with many women fearing a ‘bulked up’ look. In turn they walk away from one of the most beneficial aspects of fitness which is weight training. In order to improve strength and muscle tone, resistance is needed whether in the form of bodyweight exercises, traditional gym equipment or with the use of free weights. It’s also a great way to vary your fitness routine so you bypass stagnation and continue to see and feel solid results. If you are female or know a female that avoids weight training, this is where it ends; here are our Top 5 Weight Training Benefits For Women! 1. Weight training increases muscle mass, shaping and defining your body. Women do not have enough of the main muscle building hormone Testosterone that would result in larger muscles or a ‘bulky’ male look. Adding weights to your exercise routine will enhance your physique, improve strength and build confidence so you not only look better but you truly feel it too! 2. You can burn more body fat through an increase in lean muscle. Generally, women are more likely to ‘diet’ or have concerns over their body weight. Having increased lean muscle mass raises your basal metabolic rate so calories are burned faster even at rest. Lean muscle has been shown to burn fat at a rate of around 6 calories per pound of muscle compared to just two (or less!) calories for fat. It’s a no brainer! See this video to demonstrate what women and weights can do! Women are at a much higher risk of bone density loss through osteoporosis, particularly after menopause due to all the hormone changes or through being encapsulated in a diet fad cycle or extreme weight loss over a prolonged period of time. Weight bearing activity strengthens your skeletal system and reduces the risks of fractures as well as osteoporosis. 4. Stand taller with better posture and be body aware! Weights emphasize strong postural technique which in turn creates body awareness.You become more in tune with how your body works and how to make it work better for you! You’ll also strengthen your core muscles that enable you to stand taller, as well as sit and lift better! 5. Reduce the risk of depression and anxiety. Women are more prone to depression due to a number of factors, these include the menopause, fluctuating hormone levels and premenstrual syndrome. Women also tend to be ruled more by emotions and feelings so can get more overwhelmed through times of stress and struggle. Lifting weights improves your self esteem and self confidence; it promotes focus so you feel even more empowered. Exercising with weights also provides a big boost of serotonin and endorphins to your brain -yes those happy hormones! Being the best you means including where possible everything of direct benefit to you. Wonder women are wise and work smarter with weights! Top 5 Unusual Bodyweight Exercises! 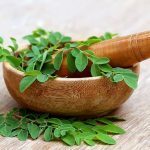 Top 5 Benefits of Moringa! 5 Supplements to Boost Your Training Results!